Static Cling oil reminder stickers are easy to apply and easy to remove. Customize your stickers with your company name and address AT NO EXTRA CHARGE. Drive repeat business back to your store! Easy to remove and apply. Take advantage of repeat business. Easy-to-read 1-1/2" x 2-1/2" 500 stickers per roll printed in black ink. Clear static vinyl sticker with very low tac backing clings to glass or any smooth surface. 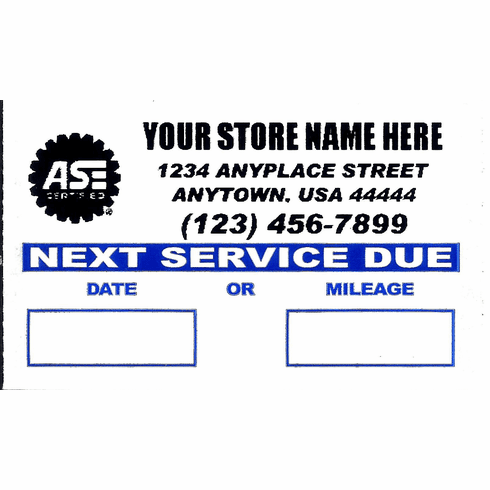 TYPE ADDRESS THAT IS TO BE PRINTED ON THE CHECKOUT PAGES IN THE "ORS INFO" BOX.